I took the notion to enter Beachy Head a year ago, after marshalling the 2017 event. I hadn’t done a marathon for a while, and hadn’t done Beachy since 2008. The 2017 day was fine, the runners who passed me were in high spirits. I should join them, I thought. Training began in July. I lost some time through illness, but not, I hoped, enough to matter. I’d run a half-marathon and two fifteen mile races earlier in the year. The trouble is, I’m slow. The fifteen milers took me 3 hours 40 minutes, roughly. The weather forecast predicted a bright but cold day, with northerly winds. I chose to wear a t-shirt in Seaford Striders blue, with long-sleeved top, and a Strides vest on top of that. On the day I arrived at St Bede’s school at the foot of Beachy Head, delivered by Mrs R. I felt a chilly, which suggested I had probably judged my clothing correctly. I made my way to the baggage room, dropped off my rucsac, and engaged in my pre-race routine of multiple visits to the gents. When the public address system summoned us to our places in the road outside the school, I put myself somewhere fitting, not too near the speed-merchants at the front, but not so far back as to become entangled with the walkers, who were brandishing their Nordic poles menacingly. I met some of the other Striders running the marathon and the 10k, many of them newer members of the club who’ve come through our Couch to 5k programme. When I used to run Beachy Head, the start was signalled by the firing of a maroon. This tradition seems to have lapsed, which is a shame. Instead we were started in a much more pedestrian way. The numbers participating have increased greatly. I think, when I used to do it, numbers were capped at 1,500, including the walkers. in the 2018 race, 2,211 finished, so more started, and many more entered but didn’t make it on the day. An index of this is the time it took to cross the line. If I subtract my chip time from my gun time, there is a difference of three and a half minutes, the time it took to cross the start line. Everyone knows, and fears, the first section of the race, a clamber up a steep slope. The numbers of runners meant progress was slow, as it would be for the first three miles or so of the race. I wanted to run, to start as I meant to continue, but it was impossible. Even once we reached the top, the narrowness of the paths kept us mostly to walking pace. From here, crossing two roads and passing the golf club, we made our way over the downs to Jevington. According to the course profile, this takes in the highest point of the race, Willingdon Hill at 193m. In Jevington there was the first of the many refreshment stops, and then we climbed a long hill, past the gallops, and into Friston Forest and a downhill. Here the dry weather of recent weeks helped us. I’ve known these paths to be treacherous when wet, but today we strode along, as sure-footed as the goats that used to graze on Lullington Heath. At the top of Wentover Hill the views were spectacular, prompting a blasphemous obscenity from one of my fellow runners. The nearby marshals, from a religious organisation, took it in their stride. Down we went towards Alfriston. Another runner held forth to his companion, decrying people who chat on runs, not paying sufficient attention to hazards such as tree-roots. He went on in this vein for some considerable time; I longed for him to trip. In Alfriston we took the path up towards Bo Peep, another tough ascent. By now, the crowding had lessened and I could have run, but I began to walk the worst of the uphill stretches. I was delighted to meet Rob and Paula, fresh from Peacehaven parkrun, who came to meet me and ran with me as far as Bo Peep, that place of mystic significance where the routes of the Beachy Head marathon and the Moyleman touch. At another refreshment station (bananas, biscuits, Mars bars) I bade farewell to them, and headed on a part of the route I know very well, the fields between Bo Peep and Seaford. After the half way point, where a lock proclaimed my time as 3:34, the route turns east at Five Ways, passing above the Rathfinny vineyard, a new addition since I ran the race in 2008. At High and Over I met the Seaford Striders marshals, who provided water, moral support and encouragement and brownies, before a descent to cross the Cuckmere, to another refreshment point in Litlington (buns, soup, tea, biscuits and two gentlemen bashing out covers of Neil Young songs on small guitars). From here we took a path over a field and into the edge of Friston Forest, climbing two sets of steps, before descending to Except. There Mrs R stood, camera at the ready, to capture this vision of athleticism and speed. By now I’d covered about 19 miles of the distance. I still had some reserves, but did myself no good at all, when stopping to talk to Rob and Simon of Seaford Striders, by knocking my head on a signpost. Nevertheless, off I went, up and down, up and down over the Seven Sisters and the totally unnecessary extra ascent. At Crowlink the Coastguard provided more refreshment, while at Birling Gap there was yet more. From here the end feels near, but can be a good hour away. There’s a long winding path, flat at first, but then beginning to climb, that goes inshore from Belle Tout, and then Beachy Head itself. I struggled up, walking, walk-running, and sometimes running after a fashion. At the top Mrs R, who had been following me round the last seven miles in the car, met me. She later said she feared I’d had a stroke, as I looked terrible, and was running sideways. It’s true I was now far from fresh, and my left side, injured in a cross-country fall two weeks before, was painful, at foot and at hip. I struggled on, through the path through the bracken, and on to fall down the final hill. I finished in a chip time of 7:11:12, 1951th of 2211 finishers. The winner was Andy Coley-Maud of Clapham Chasers in the frankly crazy time of 2:49:02, (four minutes off the course record of 2:45 set by Mike Bradley in 1991), and the first lady was Rebecca Bunting in 3:16:42. Other notable performances were Rick Curtis, purveyor of coffee to the running gentry through the Ground coffee shops in Brighton and Lewes, who finished in 3:22:52, and my fellow Seaford Striders, Jeff Young, 3:53:34, Ben Letschka 4:08:11, Louisa Scola 4:48:23, Anna Norman 4:56:48, Debbie Plant 6:20:12, Stacey Jones 6:27;26, Richard Honeyman 6:47:42 and Becky Souissi, who has been left out of the official results. Recovery is going reasonably well. I’ve been afflicted with a shocking post-marathon cold. My hip and foot have stopped hurting. I may attempt a small run with the Striders tomorrow. But I have run my last marathon. It was my thirteenth, and my sixth at Beachy Head. With less than two weeks to go to the Beachy Head marathon, I went to the first cross-country event of the 2018-19 season of the East Sussex Sunday Cross Country League, held at the beautiful Snape Wood course near Wadhurst. It’s a two-lap course with some challenging hills that I’ve run before. Murphy's Law dictates that, on a day when I aimed to trot round gently, I fell heavily on the first lap, just after the one mile mark. I carried on, with a sore jaw, chest and hip, for I landed on my left side. Everything should be better by the time of the marathon. I may have to take the next two weeks gently, though, but that was part of the plan. Thanks to everyone who helped me up, and walked with me while I recovered. It’s been so long, as Sigmund Freud is supposed to have said to Mrs Freud, when she came back from staying with her mother. Never mind, what’s past is past. What’s the current situation? I have a new Garmin. The previous one, a Forerunner 405, was a present from my mother, who died in 2006, so that gives an idea of how venerable it was. It couldn’t cope with long runs, expiring before the end of 15 mile runs and, latterly, 10 mile runs. I thought about an Apple Watch, but the new series, while covetable, don’t quite do what I want in a running watch. The chief news is that I ran, for the sixth time, the Lewes Downland Ten. 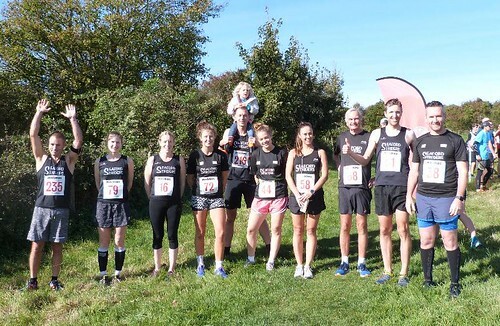 Organised by Lewes AC, this race takes the runner through some of the finest scenery in the south of England, and is marked by thoughtful touches like personalised messages on the reverse of running numbers. Mine read, “sorry you missed last year, Tom [I’d had a place for 2017, but failed to show, as it came too soon after the Eridge 10 mile] though maybe not a bad thing considering the weather - fingers crossed for a good run in good conditions this year.” The race is also well supported by AS Marolles, the running club in Lewes’s French twin town, Blois. In some years they have run wearing berets and with strings of onions round their necks. Numbers are collected in the hall of Wallands School, which is also Moyleman race headquarters. I met assorted fellow Striders, and other running chums, and then set off for the start, on Landport Bottom, again also the starting point for the Moyleman, While the Moyleman is honest with runners, and starts at the bottom of the hill and sends them up, the Downland Ten starts halfway up, sending everyone downhill before turning and making us slog our way for a more or less continuous ascent over three miles. At Blackcap there’s a water station, and I drank deep. It was a beautiful sunny day, and warm. We went on to a chalk path, the way to Ditchling Beacon, before turning off and downhill. Here Istruck up with two runners, let’s call them Pete and Sara, because they were indeed called Pete and Sara. We were the back of the pack, and, as you do on events like this, chatted of races past and future, of parkruns and marathons, and of the cut-off time for this event. Sara was worried we wouldn’t make it. I reassured her. It’s set at a generous 2 hours 45 minutes and even I can run ten miles well under that time. I said, perhaps a little patronisingly, that they seemed to be running at my pace and would have no difficulty. They may have interpreted this as a challenge as, after we had passed a long section of narrow paths, they overtook, and I lost them in Aschcombe Bottom. This section can be infernally boggy, but, though we had had rain the day before, it was dry enough. Then there’s a steep uphill, and a return to the aforementioned water station, manned by the stout men and women of the Cliffe Bonfire Society. At this point the unthinking runner might decide that the worst is behind them, but the last couple of miles, up to Blackcap itself and the beacon, is not without its challenges. I knew by now that I was the last runner. I’d been passed by a fleet-footed marshal, and a quad bike collecting the markers. I pressed on, and found myself at the top of the finish field. It’s a long way down, but I took it as fast as I could, and arrived home in 2:11:50, the last of 186 runners. I was presented with my reward, a water bottle, filled with water (not, alas, Harveys or Abyss) and overheard one of the marshals say that he was pleased as everyone had finished well before the cut-off. I’d said, after a tiring and disappointing long run the previous weekend, that the Lewes Downland would be a test for Beachy Head. If I had a good experience at Lewes, then I would go ahead with Beachy. If not, I’d take it as a sign that I was not fit enough. I am delighted to announce that I am confident Beachy will happen. I feel well and, most importantly, I think I have that sense of scale that’s necessary for a marathon. 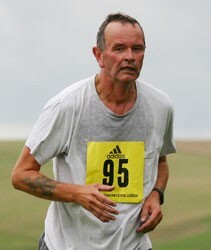 The Downland Ten was hard, but I could think of it as relatively short compared to marathon distance.